The following business incorporations were recorded in Hampden, Hampshire and Franklin counties and are the latest available. They are listed by community. Gabriel Transportation Inc., 91 Cross Brook, Amherst, MA 01002. Kebede Gashie, same. Transportation services. Greater Springfield Girls Fast Pitch Softball Program Inc., 168 Barton Ave., Belchertown, MA 01007. Darrell Phillip Weldon, same. Develop, manage, and organize a girls youth fast pitch softball program. Go Fast Inc., 290 Hubbard Ave., Dalton, MA 01226. Evan Drosehn, same. Sales. 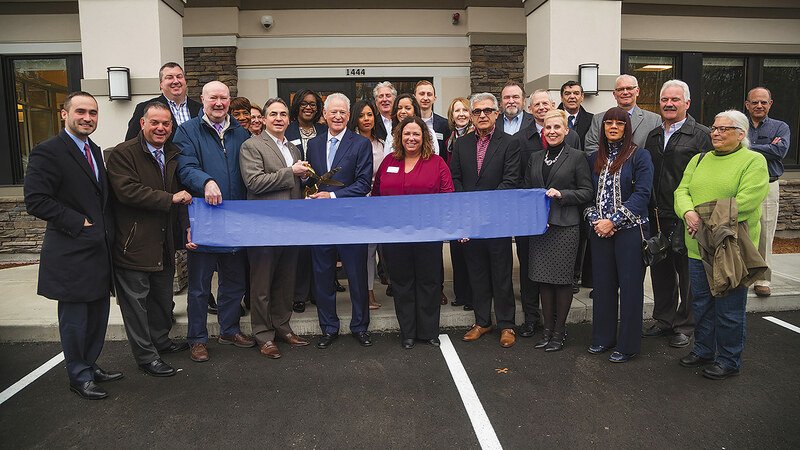 Forge Property Management Inc., 444A North Main St., Suite 315, East Longmeadow, MA 01028. Lucas Giusto, same. Real estate management. Flipflopwws Inc., 63 West State St., Suite 972, Granby, MA 01033. Sylvester Jones, same. Real estate development. Green Blasting Solutions Inc., 42 River Dr., Hadley, MA 01035. Rick M. White, same. Environmentally friendly water-blasting solution. Hayan Inc., 70 South St., Hinsdale, MA 01235. Kirankumar N. Patel, 6 Glen Meadow Road, Franklin, MA 02038. Liquor store. Gotham City Music Group Inc., 137 Leona Drive, Pittsfield, MA 01201. Marissa J. Light, same. Music production, sales, performances. Friends of STCC Inc., One Armory Square, Suite 1, P. O. Box 9000, Springfield, MA 01102. Franklin D. Quigley, 10 Old Farm Road, Wilbraham, MA 01095. 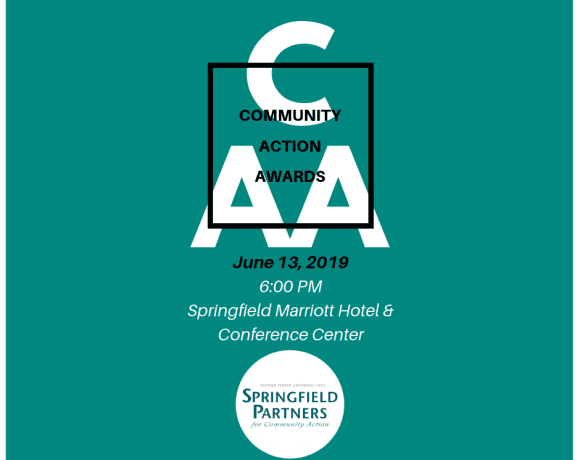 Own and manage parking facilities in order to exclusively support the charitable and educational operations of Springfield Technical Community College. Grateful Development Inc., 38 Lariviere Ave., Three Rivers, MA 01080. Christopher A. Spagnoli, same. 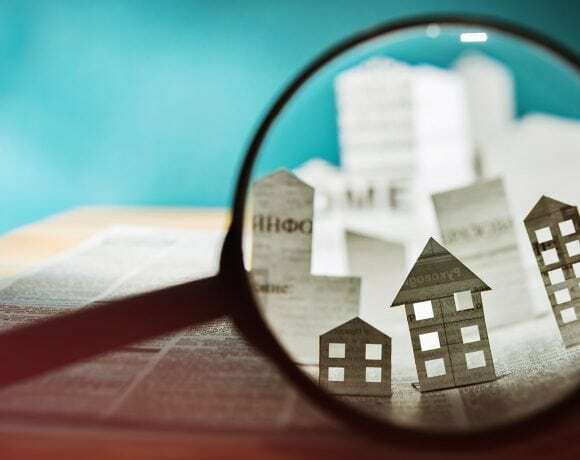 Real estate development and consultation. Firsov Express Inc., 52 Southworth St., West Springfield, MA 01089. Vitalii Firsov, same. Transportation. 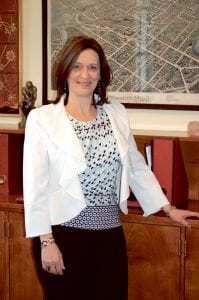 Denise Miller-Zhang PC, 159 Main St., Unit N, Agawam, MA 01001. Denise Miller-Zhang, same. Psychologist office. Dimoda Inc., 175 State St., Unit 6, Belchertown, MA 01007. Ilario Modafferi, same. Merchant financial services. Fog Farm Inc., 116 Pleasant St., Granby, MA 01033. Nicholas Robinson, same. Farming and growing plants. JA Transport Inc., 88 Calumet Road, Holyoke, MA 01040. Joseph Arsenault, same. Trucking transportation of materials. Delta T Advanced HVAC Inc., 40 Maine Ave., Easthampton, MA 01027. Matthew B. Gawle, 80 Highland Ave., Easthampton, MA 01027. Heating and air conditioning sales and service. Collabra Technology Inc., 82 Wendell Ave., Ste. 100, Pittsfield, MA 01201. Janet Case, same. Marketing and sales platform. Evisort Inc., 82 Wendell Ave., Suite100, Pittsfield, MA 01201. Jerry Ting, same. Consultant and document management. Great Societies Inc., 82 Wendell Ave., Suite 100, Pittsfield, MA 01201. Ramon Xulvi-Brunet, same. Consulting and education service to institutions. Great Woods Distribution Inc., 82 Wendell Ave., Suite 100, Pittsfield, MA 01201. Elliot Oliveira, same. Contract manufacturer. Environment 1st Pest Management Inc., 9 Industrial Road, Southwick, MA 01077. Brian J. Morrissey, 6 Joseph Ave., Westfield, MA 01085. Pest management, commercial and residential cleaning services. Crockwell’s Mobile Welding Inc., 211 Russellville Road, Westfield, MA 01085. Nickolas R. Crockwell, same. Mobile welding services. Cold Spring Liquor Inc., 19 Ruth Dr., Wilbraham, MA 01095. Dariusz Karpinski, same. Convenience and package store. Agile Rhythms Inc., 1497 Dunhamtown Brimfield Road, Brimfield, MA 01010. Eric Jaeger, same. Leadership training, process improvements. 76 Liquors Inc., 228 Coyote Circle, Feeding Hills, MA 01089. Diana Elizabeth Eisenbeiser, same. Retail liquor store. Animal Control of New England Inc., 266 Goss Hill Road, Huntington, MA 01050. Paul Hewes, same. Animal control. Alex Freeman Company, 24 Ridge Road, Longmeadow, MA 01106. Alexander G. Freedman, same. Business consulting. Baystate Concrete Pumping Inc., 37 Main Road, Montgomery, MA 01085. Victor Sinigur, same. Sinigur concrete pumping service. Berkshire Roots Inc., 100 North St. Suite 405, Pittsfield, MA 01201. Albert S. Wojtkowski, same. Marijuana establishment. ACMS Corp., 85 Wait St., Springfield, MA 01104. Robert E. Sullivan, same. General contracting and construction. Boston Eye Group P.C., One Monarch Place, Suite 310, Springfield, MA 01144. Sam Goldberger, 223 Grant Ave., Newton, MA 02459. Render medical services. Aviva Romm Enterprises Corp., 27 West Alford Road, West Stockbridge, MA 01266. Aviva Romm, 630 Main Road, Monterey, MA 01245. Operating a medically oriented writing, speaking and publishing business. 420 AU Inc., 4 Wilder Terrace, West Springfield, MA 01089. Michael Anthony Skowron, same. Jewelry, retail, advertising, marketing, and communications. 5 Star Logistics Inc., 342 Southwick Road, Apt. 135, Westfield, MA 01085. Islam Agayev, same. Long haul trucking. Brookline Hair Inc., 31 Glenn Dr., Wilbraham, MA 01095. Maria J. Serra, same. Hair salon, day spa, buy and sell body treatments. Just over a decade ago, BusinessWest launched a new recognition program, Difference Makers. 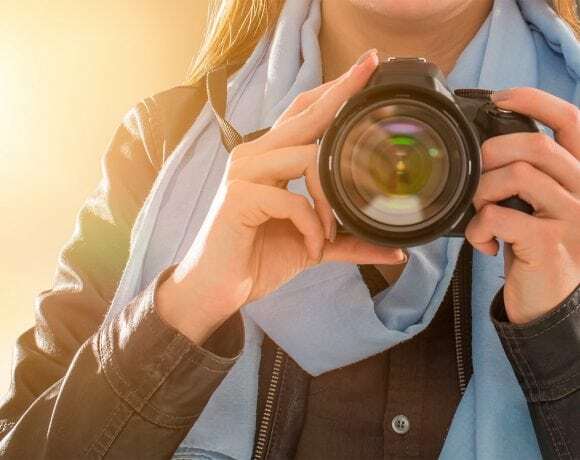 And in many ways, the past 10 years have been a celebration of the many different ways groups and individuals can make a difference in their community, and this region as a whole. Indeed, those making their way to the podium at the Log Cabin Banquet & Meeting House in Holyoke have included a sheriff of Hampden County, a police chief in Holyoke, the president of UMass Amherst, the founder of Rays of Hope, the director of Junior Achievement, the co-founder of Link to Libraries, the creators of Valley Venture Mentors … the list goes on. • Let’s start with the Food Bank of Western Massachusetts. This Hatfield-based agency, launched in the early ’80s, is a Difference Maker on many levels, from the 11.6 million pounds of food and 9.6 million meals it provides to area shelters and soup kitchens, to its Coalition to End Hunger, which is raising awareness of the problem, attacking the stigma attached to it, and advocating for those in need. For almost 40 years, the Food Bank has been answering the call. • The same is true of Joe Peters, a businessman who has always had an influence that has extended far beyond the walls of Universal Plastics. It has extended across Chicopee, the city he grew up and still lives in today, with initiatives such as the so-called ‘sandwich ministry,’ a program he helped start to feed the homeless in that city. And it has extended all the way to Guayape, Honduras, where he helped bring a new ambulance to that hurricane-ravaged village. He has always looked for new ways to step in and change lives for the better. • As has Peter Gagliardi, the long-time president and CEO of Way Finders. He has spent the past 45 years working in the broad realm of housing and the past quarter-century at Way Finders, where he has greatly expanded the mission and, while doing so, has changed lives and helped change the course of entire neighborhoods through the power of collaboration. 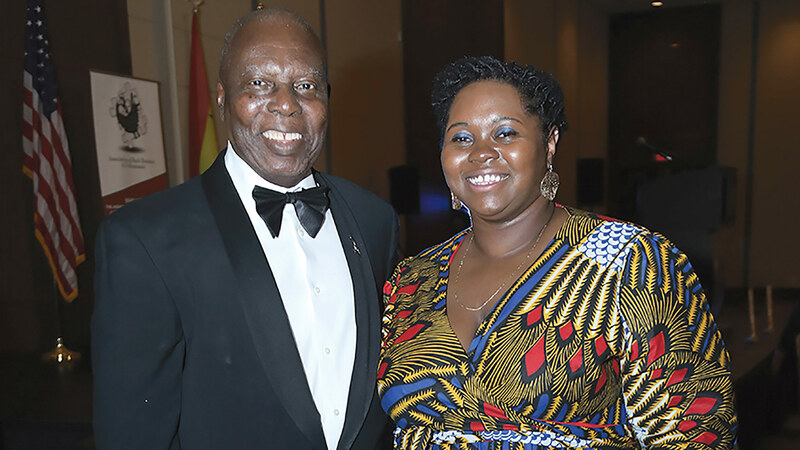 • Frederick and Marjorie Hurst have always been catalysts for positive change within their community, especially through the newsmagazine they created called An African American Point of View, a name that speaks volumes about its mission and importance to the community. It blends community news with often-unsparing commentary, and speaks with a powerful voice, just like its founders. • The Springfield Museums, as a cultural institution, is a different kind of Difference Maker. For more than 160 years, it has helped bring art, science, history, and memories to visitors from across this region and far outside it, a mission that entered a new dimension with the opening of the Amazing World of Dr. Seuss Museum in 2017. Collectively, the Museums have helped put Springfield on the map and make it far more of a destination. 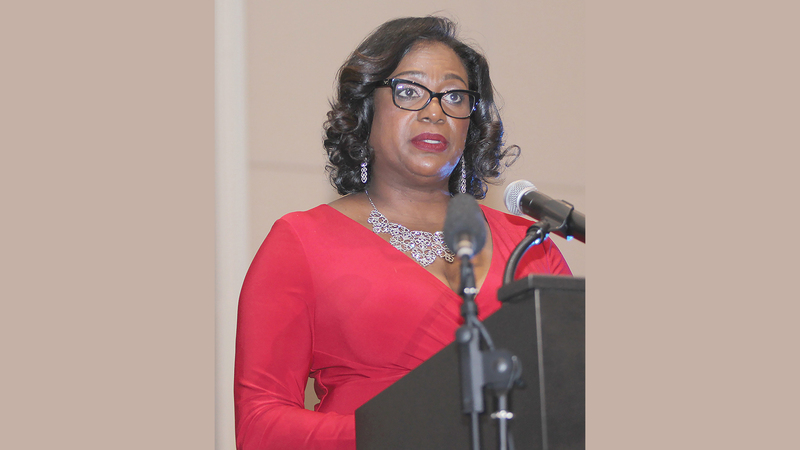 • Meanwhile, Carla Cosenzi, co-president of the TommyCar Auto Group, has found her own ways to make a difference. First, as a successful business owner and, therefore, role model and mentor to many young women. But also has a warrior in the battle against cancer, the disease that claimed the life of her father, through the Tommy Cosenzi Driving for the Cure Golf Tournament. As we said, there are no limits on the ways that an individual or group can make a difference here in Western Massachusetts, or in Guayape, Honduras for that matter. That’s what we’ve been celebrating for the past decade, and the celebration continues with the class of 2019. The Assoc. 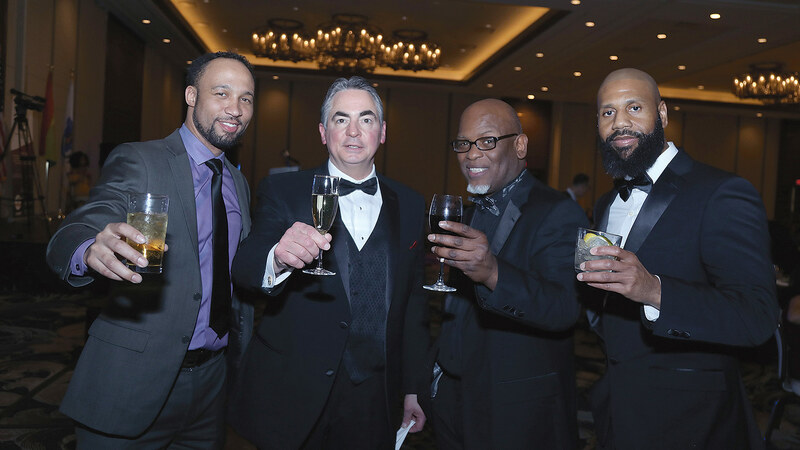 of Black Business and Professionals (ABBP) hosted its third annual Black Tie Gala on Jan. 19 at the Aria Ballroom at the MGM hotel in Springfield. 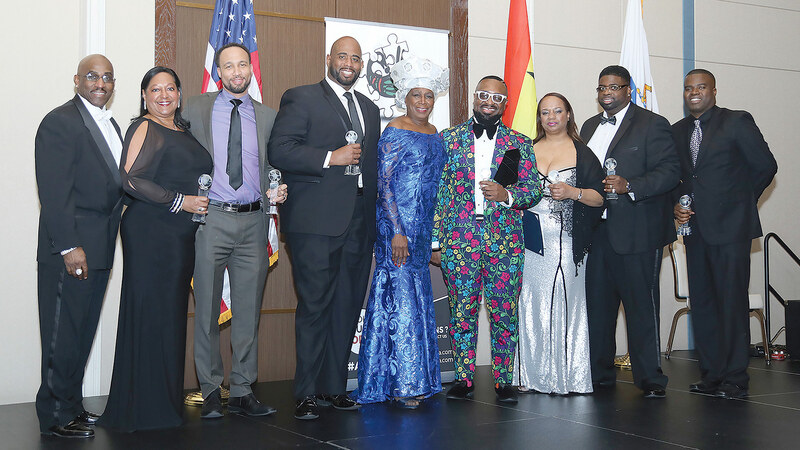 During the gala, the association recognized 10 businesses and professionals were that have contributed significantly to the growth and development of the local black business community. The keynote speaker was Barfuor Adjei-Barwuah, ambassador of the Republic of Ghana to the U.S.
From left, Clemons, Springfield Mayor Domenic Sarno, mayoral aide and ABBP executive board member Darryl Moss, and Lordi Smith of Micro Scalp Clinic. 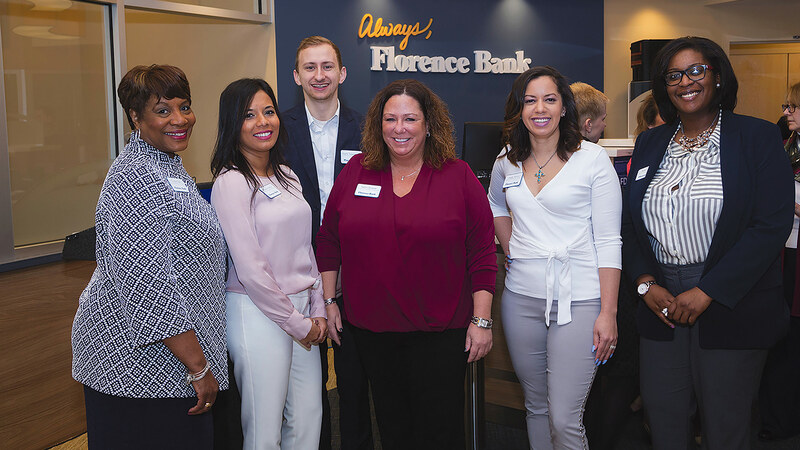 Florence Bank recently cut the ribbon on its second Hampden County branch, at 1444 Allen St. in Springfield. Bank staff, board members, and corporators were on hand at the ceremony, along with civic leaders. 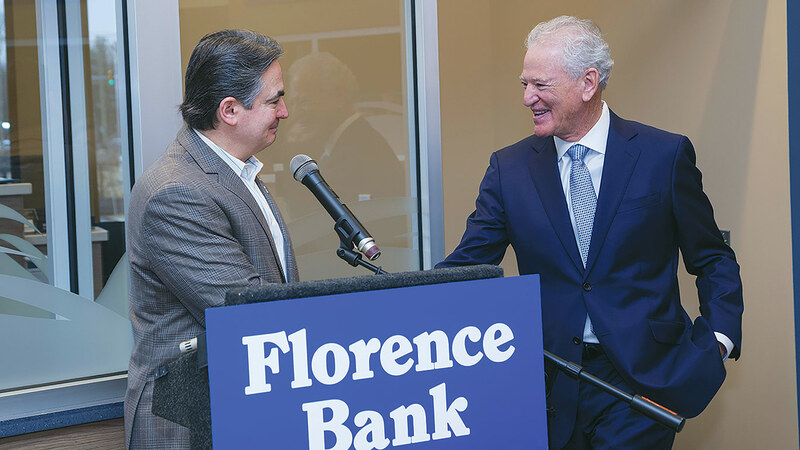 Sarno (left) greeting Heaps and welcoming Florence Bank into the city. 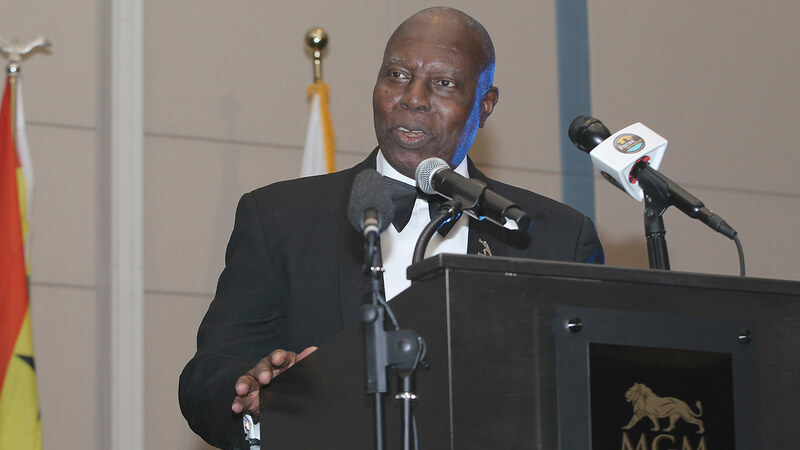 The 79th annual Model Congress at American International College, the longest-running continuous model congress of its type in the nation and one of the college’s oldest campus traditions, convened at AIC during the Martin Luther King Jr. holiday. Eleven high schools throughout the Northeast came to campus to write, debate, and pass legislation in a weekend-long simulated congress. 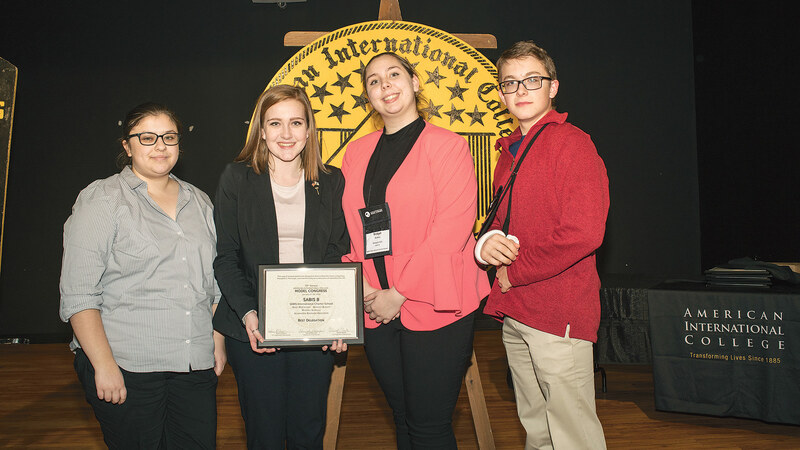 The Best Delegation award was presented to (pictured, from left) Alexandria Barnard-Davignon, Rose McCaffrey, Bridget Bushy, and Michael Scoville from SABIS International Charter School. The Best Bill award was given to Chinaly Chanvong and Jada Ficarra, also from SABIS. McCaffrey was named this year’s top delegate, and will receive the Kathryn Mauke Scholarship, a full four-year tuition scholarship to AIC. Second- and third-place delegates were Althea Brennan and Pamela Mountain, respectively, from Chatham High School in New York, who receive a $10,000 and a $5,000 four-year scholarship to AIC.